24 HOUR MEGA-DEAL ON PAPER PUMPKIN!! WHAT A DEAL!! THIS HAS NEVER HAPPENED BEFORE! 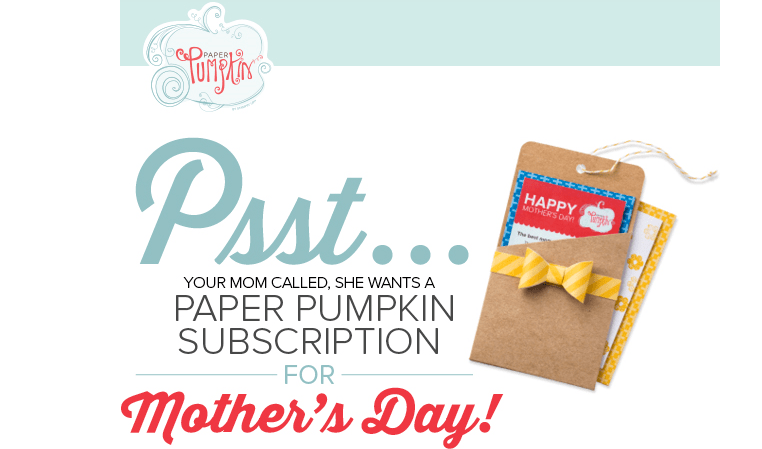 Hurry and get your amazing deal on a new Paper Pumpkin subscription! For 24 HOURS ONLY, ending 7:50 pm (Pacific time), CLICK HERE to sign up for Paper Pumpkin, using the promo code 24HOURS, and you will pay ONLY $7 – SHIPPING INCLUDED! Are you still trying to think of the perfect Mother’s Day gift? Well, your problem is solved! Your Mom is going to LOVE receiving this fabulous craft kit in a box; it includes everything to make completed projects, including the cardstock, adhesives, ink spots, stamps, embellishments and more! If she likes to get crafty on her own, she doesn’t even have to follow the directions, but they are included in the box. Easy, peasy, lemon squeezy! This offer is for new subscriptions only, and is only available for 24 hours – ending 7:50 pm Pacific Standard Time. If you decide to purchase this as a Mother’s Day gift, send me an email at debsmart@shaw.ca, and I’ll send you a gift tag that you can print & fill out, to let Mom know her gift is on it’s way! Don’t delay – go to www.paperpumpkin.com by CLICKING HERE, enter Promo Code 24HOURS, and enter my name, Deborah Smart, as your Demonstrator. Next Next post: Get this deal NOW!